When I was 11 years old I was diagnosed with Anaplastic Large Cell Lymphoma. That same year I got involved with Smile-A-Mile by going to camp. I had just finished a round of treatment, so I was tired and really didn’t want to go, but I’m so glad my nurses and family managed to convince me. I was able to participate in so many activities that I didn’t think I’d ever be able to, like going out on the lake and doing woodwork. 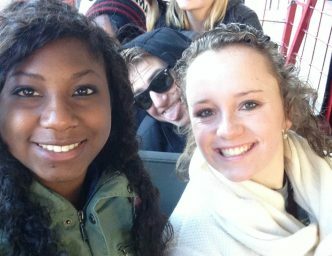 On outings like our Boston trip I was able to make memories with friends that will last forever. I’m glad to say that throughout the years I’ve made lifelong friendships with other campers and counselors. Everyone is just so kind! Camp is just such a loving and impactful place, it provided the support I needed at a difficult time in my life. Fast forward to today, I’m 19 and currently recovering from a relapse of my cancer. I’m glad to say that the SAM staff has been by my side like family the entire time. I’m beyond thankful for everything that Smile-A-Mile provides for survivors. I can’t wait until I’m able to return to camp as a counselor to give back a little of what SAM has given me, and to have fun!